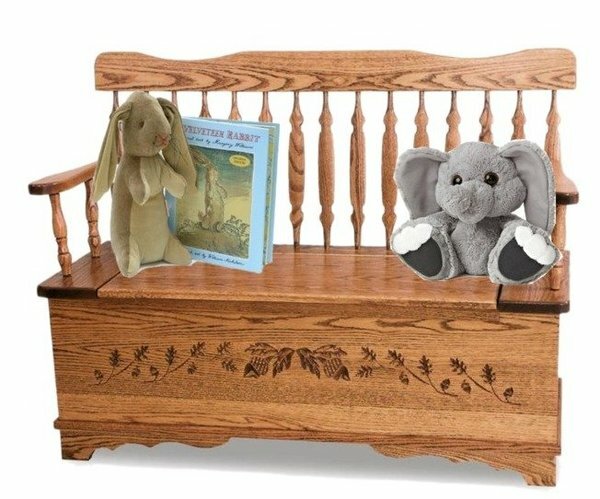 Embracing fun and family and exuding a warm country charm, the Amish Royal Arrow Acorn Storage Bench will be right at home with your country style furniture collection. The appeal of fall and everything that is gentle about it is reflected in the delightful acorn pattern on the front of this bench. Grace your hallway, entryway, foyer, mudroom or the kids playroom with this beautiful bench that offers a sturdy, cozy seat and a spacious storage compartment to boot. Sit and change shoes on this solid wood bench and store your sneakers and slippers inside. The Royal Arrow Acorn Storage Bench is perfect to hold games and toys, or place it at the foot of the bed in your guest bedroom with extra linens and blankets inside. Invest in a solid wood bench that will serve your family for years. Save money knowing this Amish bench will not wear out or break. Call us today to get your order started. Toll-free at 866-272-6773.